The True Costs of Fossil Fuels? The hidden health and environmental costs of energy production and consumption in the US could exceed $120 billion (£73.6 billion) per year, according to a new report from the US National Research Council (NRC). The report provides new ammunition for those arguing that green energy should be a priority. The $120 billion estimate is for 2005 and comprises damages related to electricity generation and transportation, principally involving emissions of nitrogen oxides, sulfur dioxide, and particulate matter. The bulk of the effects result from the human health impacts of air pollution, including premature death, and increased risk of respiratory conditions like chronic bronchitis or asthma. Maureen Cropper, an economist from the University of Maryland, US, who served as vice chair of the NRC committee that wrote the report, says they came out with a 'very conservative number' because climate change impacts were not factored into the cost assessment. 'Renewables and nuclear look much cleaner in contrast to fossil fuels, so this makes in comparative terms part of the argument for renewables,' Cropper says. The damage from pollutants from nuclear, wind or solar energy are almost zero, says Cropper, but the total costs of obtaining these cleaner sources of energy need to be considered and factored into the equation. The NRC finding echoes a joint policy statement released earlier this year by the American Chemical Society (ACS) and the American Institute of Chemical Engineers, which urged policymakers to capture hidden costs of energy production. The NRC panel finds that coal, which generates about half the electricity produced in the US, is the most expensive fossil fuel. The report estimates that in 2005, total external damages from burning coal in the country's 406 primary coal-fired power plants were roughly $62 billion. These damages average about 3.2 cents for every kilowatt-hour of energy produced. 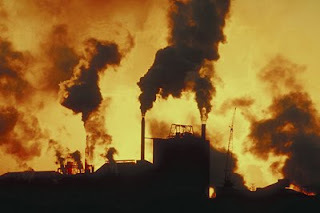 "Burning coal causes damages valued at about 3.2 cents for every kilowatt-hour of energy produced"
The NRC panel concludes that substantially reducing non-climate and climate damages would require major technical breakthroughs, including cost-effective conversion of cellulosic biofuels, cost-effective carbon capture and storage and substantial further reductions in emissions, as well as an increase in renewable energy capacity or other forms of electricity generation with lower emissions. Marlo Lewis, a senior fellow at the Competitive Enterprise Institute - a conservative think tank that gets some of its funding from companies making petrol fuelled cars - is sceptical about the report's conclusions. He emphasises that decarbonisation is a 'horrendously expensive' way to reduce air pollution, and argues that there are technologies for attacking particulate matter, nitrogen oxides and sulfur dioxide that are much cheaper than simply abandoning fossil fuels. 'Just telling people not to use the most affordable fuel is not effective,' Lewis tells Chemistry World. He says the NRC report presents a 'one-sided, misleading picture' by failing to acknowledge the positive benefits of energy production and consumption, including lives enhanced and saved by new technologies. He also questions the political motivation behind the report, which was requested by Congress in 2005. 'Why do we need all of these experts to tell us energy production causes air pollution that damages health,' he asks. As Eskom continues to debate the prolonging of projects, Kusile coal-fired power station continues to be the center of attention. However, Eskom CEO Jacob Maroga insisted that Kusile would remain on schedule. “We are saying… let’s commit ourselves to ensuring that [Kusile] doesn’t stop, and to the extent that there is a [funding] gap, let’s see how we can close it,” Maroga said. “We want to continue with the build,” he stressed, adding that Eskom was also committed to closing what would be a R30-billion funding gap should the requested increases be granted. If the project was put on hold, Eskom would have a greater cash flow. Alternately, the state-owned utility would face the prospect of serious penalties including the increase in costs once the project was restarted. The only potential upside from the deferral of Kusile would be the impetus that it might provide to the much-frustrated independent power producer (IPP) program. Indeed, the government and Nersa would have to turn to IPPs to urgently remedy what would otherwise be a significant supply-side gap. So, what will Eskom do? This photo of their Camden Coal Fired station is only 27-32% energy efficient. This means that well over 60% of the heat liberated goes up the cooling towers to warm the air. That means they burn 3-4 times more coal to generate just electricity: This is the magnitude of their waste and one-dimensional thinking. 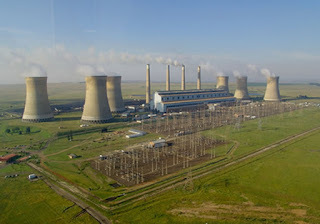 The World Wide Fund for Nature (WWF) in South Africa asked the government and state-owned utility Eskom to reconsider plans to complete the construction of the Kusile coal-fired plant which would substantially increase to country’s carbon emissions. The call from the WWF came shortly after Eskom indicated that it might have to defer certain projects, such as the R100-million Kusile power station, if a far higher tariff path did not emerge. 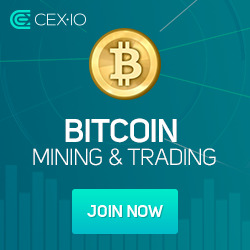 The project could be delayed by between 18 and 36 months. The first unit of Kusile was currently scheduled to come online by early 2013. Sun Earth Energy is the generation arm of a group of international companies in the business, good and proper, of Alternative Energy. We have several web sites which will be developed in the next few weeks to show our thinking and strategy. Especially for central and Southern Africa. Watersons MG Ltd is the research arm. Sun Earth Energy is the gererator, waste reduction and facilitatior of more environmentally friendly fuels for Europe and the US. We will add articles of interest as time allows. But firstly we are worried about the actions being taken to generate electricity in Central Africa and South Africa. Too many 'heavy' industrialists are influencing policy makers to burn Coal, Gas and even to promote Nuclear. Even massive Hydro shcemes have to looked at in the context of huge environmental impacts and the displacement of large numbers of the local population. We are not too impressed with the 'simplistic' view regarding the so called 'bio-fuels'. To displace crop growing for food to make bio-diesel and suchlike to run cars is counter-productive. We have a simple set of strategies to bring wealth to local regions, to increase the generation of electricity, to process more drinking water and to create employment.